The Footwear Industry Awards 2018: Winners revealed! The very best from across the footwear sector gathered at Birmingham’s National Conference Centre on Sunday 18 February to find out who would be taking home a prestigious accolade at the seventh annual Footwear Industry Awards. Organised by Datateam Business Media, publisher of Footwear Today magazine, and supported by the British Footwear Association (BFA), the Independent Footwear Retailer’s Association (IFRA) and the Society of Shoe Fitters (SSF), the Awards recognises and rewards the brands and individuals that make the sector so vibrant. The evening began with an exclusive cocktail reception, giving guests the chance to catch up with industry friends and colleagues, before the ceremony opened with a stand-up routine by critically-acclaimed comedian Sean Collins. Loake was the recipient of the evening’s first Award, clinching Men’s Footwear Brand of the Year, before Skechers was honoured as Ladies’ Footwear Brand of the Year. Superfit came out on top in the Children’s Footwear Brand of the Year category, while Grisport received the Outdoor Footwear Brand of the Year accolade and Waldlaufer was announced as the Comfort/Wellness Footwear Brand of the Year. Lunar took home the Fashion Footwear Brand of the Year award, Woly – Victor De Bank was presented with the Shoe Care & Accessories Brand of the Year accolade and to conclude the brand categories, Rieker was revealed as the winner of the hotly-contested Footwear Brand of the Year title. After dinner, the evening’s celebrations continued with the Retailer categories. The first retailer called up to collect an award was Robin Elt, winning the Men’s Independent Footwear Retailer of the Year title, followed by White & Sons Shoes, recipient of the Ladies’ Independent Footwear Retailer of the Year award. Goody2Shoes was victorious in the Children’s Independent Retailer of the Year category, while Charles Clinkard took home the Fashion Independent Footwear Retailer of the Year award. North Shoes clinched two awards on the night, Outdoor Independent Footwear Retailer of the Year and Independent Family Footwear of the Year while Little Brogues was the recipient of the New Independent Footwear Retailer of the Year accolade. In the Multiple Footwear Retailer of the Year category, Johnsons Shoes/Bowleys Fine Shoes came out on top and the Society of Shoe Fitters presented its Student Shoe Fitter of the Year award to Shah Nawaz Kahn of Hotter. The evening’s presentation concluded with the Industry awards, which saw Ghetz’s Gerry Walker take home the Platinum Shoe Award and Skechers pick up its second of the night in the Leader in Customer Service category. Gardiners were also presented with two awards, picking up Best Use of Technology/E-Tailer of the Year while Mark Flenley of Gardiners was honoured as Footwear Designer of the Year. Marcus Baker of Legero was presented with the coveted Personality of the Year award, and last but certainly not least, the winner of Shop Front of the Year was revealed as SoleLution. The Footwear Industry Awards continued its time-honoured tradition of giving back by carrying out a charity fundraiser for Footwear Friends, which has been supporting the sector for over 175 years, and The Bobby Moore Fund, which funds pioneering, life-saving bowel cancer research. Throughout the evening, guests gave generously and rose a generous amount for the two charities. 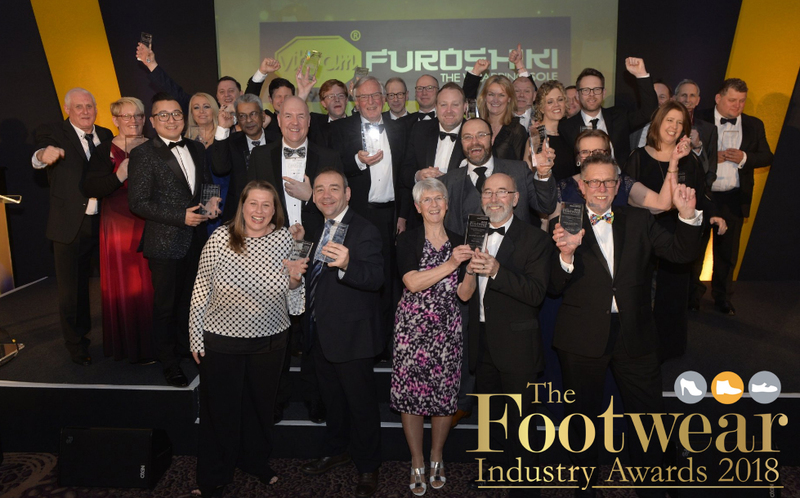 The 2018 edition of the Footwear Industry Awards was sponsored by Skechers, Cherry Blossom, Froddo, Hotter, Moda Footwear, Petasil, Rieker and Remonte, Superfit and Legero and Vibram Furoshiki. For more information and to browse the Footwear Industry Awards gallery, visit www.footwearindustryawards.com.